Last time I told the sorry tale of my friend John, who for altruistic reasons, sought Greek citizenship. He ended up in the kind of situation Franz Kafka described so well -- foggy, corrupt, wasteful & ultimately sinister. Are there any insights & lessons for Lean thinkers? For a start, we can identify the types of waste John experienced: delay, over-processing, defects, motion, transportation and knowledge waste. Perhaps, but acknowledging the problem is the first step toward a remedy. Governmental agencies around the world are prone to this dynamic. Excellence in public service can be a major competitive advantage -- or disadvantage. Public servants deserve what Deming called "pride of workmanship" -- the right to be involved in designing, and improving their work. John told me his story in a beautiful outdoor cafe in Toronto's prosperous Greektown. All around us, Canadians of Greek descent went about their business with purpose & energy. "Why," John asked, "do Greeks need to leave Greece to prosper?" John suggested Lean Pathways could help improve service in the Greek bureaucracy. 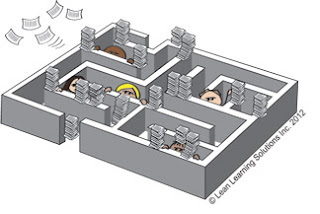 Underlying the Greek bureaucracy is a set of dysfunctional mental models, which make process kaizen impossible. Let me conclude with a question. How do you change mental models in the Greek bureaucracy, or any large organization?